Is there a duty to disclose third party funding in international arbitration? In the resolution of disputes through international arbitration, whether it involves cases of Investment or Commercial Arbitration, parties increasingly resort to so-called “third party funding” (“TPF”). TPF provides prospective parties to a dispute with the ability to request financing from other entities to push forward their claims in Arbitration, when they are themselves unable or unwilling to bear the costs of the proceedings. In exchange, the third party funder will usually withhold some portion of the final amount awarded, should the financed party win the case. A wide array of entities may act as third party funders, a fairly comprehensive list of which may be found here. Aside from enabling recourse to justice to those unable to bear the costs themselves and equalizing parties, TPF is increasingly hailed as a smart business technique, which allows companies to maintain their liquidity and to continue their profitable ventures. By using external capital to finance their legal disputes, they do not tie up their funds in arbitration or lose competitive credit rates (which usually deteriorate when involved in legal proceedings, since the worth of their claims cannot be appraised by conventional commercial loan services). Practitioners remain perplexed about the many contours of this financing tool and the disclosure obligations it entails. “For these purposes, the terms ‘third-party funder’ and ‘insurer’ refer to any person or entity that is contributing funds, or other material support to the prosecution or defence of the case and that has a direct economic interest in, or a duty to indemnify a party for, the award to be rendered in the arbitration”. Much of the controversy around TPF relates to the obligation to disclose potential conflicts of interests with the arbitrators of the dispute. Since third party funders are not themselves parties to the ongoing disputes, they are prima facie not bound by the same disclosure obligations which bind the parties. This creates potential for abuse of process, as well as the risk of rendering awards that will be unenforceable should a conflict of interest be discovered in the future. Some argue that the system is self-regulating and that no problems will arise in the current framework, since those aware of the conflict are the same people that are most interested in winning and would thus disclose any potential conflict. However, considering the often-sensitive subject matter of some arbitrations, this is a valid concern. Investment arbitration deals with the rights and interests of States, rather than those of mere private entities, and safeguarding the transparency and impartiality of the proceedings ensures legitimate and enforceable outcomes. “The parties’ duty of disclosure of any relationship, direct or indirect, between the arbitrator and the party […] has been extended to relationships with persons or entities having a direct economic interest in the award to be rendered in the arbitration, such as an entity providing funding for the arbitration, or having a duty to indemnify a party for the award”. The ICC, in its 2016 Guidance Note for the disclosure of conflicts of arbitrators, has copied the wording of the IBA Guidelines and included a duty to consider conflicts of interest with TPF. However, the ICC did not make it mandatory for the parties to disclose the existence of a TPF, which undermines the provision’s effectiveness. Until the adoption of a binding framework by arbitral institutions or by States, disclosing TPF and conflicts of interest will remain discretionary, for better or for worse. 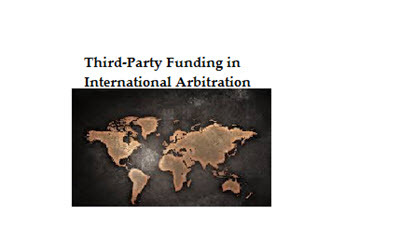 The increasing relevance of TPF for international arbitration, however, militates in favor of rules regarding a duty to disclose third party funding in international arbitration. Explanation to General Standard 7 (a).